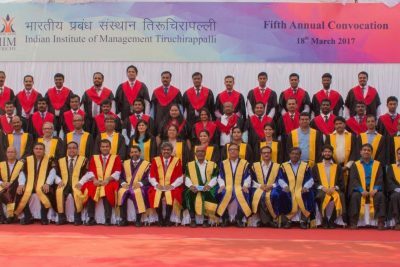 Pride and nostalgia were visibly on display at the Fifth Annual Convocation of the Indian Institute of Management Tiruchirappalli, to award the Post Graduate Diploma in Management (PGDM) and the Post Graduate Diploma in Business Management (PGDBM), was held on Saturday, 18th of March 2017. Shri. 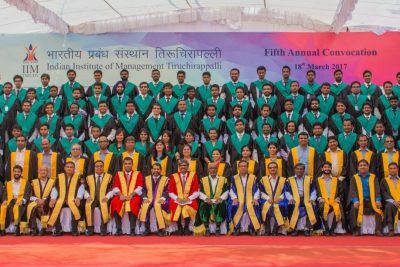 D Shivakumar, Chairman & CEO, Pepsico India Private Holdings Limited, and Shri.Shivendu Nadkarni, Vice President, Asia/Africa Snacks, Kellogg’s were the Guests of Honour for the convocation. 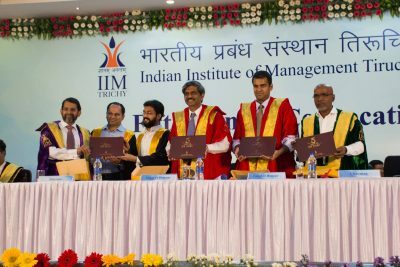 Dr. R. Karunamurthi, Chairman of the Convocation, and Member of the Board of Governors, IIM Tiruchirappalli awarded the diplomas to 108 graduates of Postgraduate Programme in Management (PGP)and 33 graduates of the Post Graduate Programme in Business Management (PGPBM). Dr. Prafulla Agnihotri, Director, IIM Tiruchirappalli presented the Director’s Report. The Director, in his report, highlighted the exceptional placement season of IIM Trichy. IIMT witnessed a 56% increase in the highest stipend offered for the summer placements and a 39% increase in highest CTC offered for the final placements. He said that these achievements were because of the quality of the students and the hard work of the faculty. He congratulated Mr. Upendran Vasu and Mr. Anirudh Jain for securing the second place in the GSCMI intercollege case study competition held by the Purdue University. He exhorted the graduating batch of students to take care of their parents, who have been instrumental in their successes.He also advised them to set their own standards and be ethical, honest and responsible managers. At the end of the report, Dr. Prafulla Agnihotri invited the Guests of Honour and the Chairman to release the “Special Edition of the Institute Newsletter commemorating 5 years of IIM Trichy”. This special edition had been prepared by the faculty and students editorial team to commemorate the five glorious years since IIM Trichy’s inception. The publication captures the various milestones crossed, the initiatives implemented on various fronts and the awards and recognitions the institute has achieved over the years.It also highlights the steady growth in the placement figures across domains, the business events conducted on campus, the significant club activities and the noteworthy achievements of students, research scholars and faculty members. Mr. Shivendu Nadkarni, the Guest of Honour began his speech with the quote “Success is a journey, not a destination”. He shared fours lessons (4 H’s) from his personal and work experience with the graduands. The first lesson being “Heart greater than Head”, he urged the students to use their heart along with the head. “Make trust your second nature, there will be a magical payback”, said Mr. Nadkarni. The next lesson that he mentioned was “Fuel your Hunger”. One needs to have a constant hunger to win, succeed and make a difference. Mr. Shivendu noted, “The two engines to fuel one’s hunger are Passion and Hardwork”. The third lesson that he shared was “Patrol your Health, Invest in wellness”. He stressed that one should focus on work and personal life balance. The final lesson was “Embrace Humility”, where he appraised the importance of listening to understand rather than to respond. He ended his address by entreating the students to enjoy the roller coaster ride of life. The Guest of Honour, Mr.. D Shivakumar, in his address, reflected upon how fast the world has become today and how one needs multiple capabilities to get through a career. He further advised the graduates five things- focus on learning, invest in the community, keep being curious, listen more than you speak, and not to lose passion in life. He ended his address by highlighting three sets of people: teachers, classmates, and parents, and urged the graduates to keep giving them reasons to brag about them. Members of the Board of Governors, faculty members, graduating students, staff, parents, members of the media and other distinguished guests were present at the convocation ceremony. The Post Graduate Programme in Management (PGPM) is the two-year flagship programme of IIM Tiruchirappalli. Its main objective is to transform the young talents into competent and socially responsible managers who will be capable of working in any sector and driving the organisation through their exceptional leadership and performance. The first batch of this program started in 2011. The Post Graduate Programme in Business Management (PGPBM), a two-year programme for working executives, is offered at IIM Trichy’s Chennai Centre. PGPBM was launched in 2012, and the third batch of this programme graduated today. The curriculum of PGPBM is aligned with the two-year PGPM programme offered at Trichy. The classes are held from Friday to Sunday, to suit the requirements of working executives.